This beautiful quaint village is located along the shore of the Niagara River and Lake Ontario. Only a 15 minute drive from the Falls. Niagara on the Lake has a lot to offer from antique shops to horse drawn carriage rides, hotels, B&B’s, restaurants and wineries. Plus the prettiest 9 hole public golf course ! 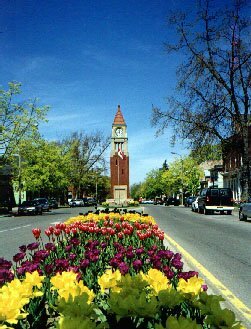 Niagara-on-the-Lake, often called the loveliest town in Ontario, has a long and distinguished history. Site of the old Neutral Indian village of Onghiara, it was settled at the close of the American Revolution by Loyalists coming to Upper Canada, many of whom had been members of the much feared Butler’s Rangers based during the American Revolution at Fort Niagara, then under British control. In 1781 the British Government purchased land from the Mississaugas; a strip of land 6 miles wide along the western bank of the Niagara River for “300 suits of clothing”. By 1782, 16 families had become established and had cleared 236 acres. In 1791 part of the military reserve at the mouth of the river was chosen as the future townsite. In 1792, Newark – as it was named by Governor Simcoe, became the first capital of the newly-created colony of Upper Canada, and the legislature met here for five sessions, until Lieutenant-Governor John Graves Simcoe moved the capital to York. By 1796, 70 new homes were built, and the town continued to prosper as the economic, administrative and judicial centre for the Niagara Peninsula. The physical appearance of the town, with the exception of the powder magazine at Fort George was virtually erased by the burning of the town by the Americans during the war of 1812. Visit www.niagaraonthelake.com for more information. If you have any spare time during your visit to the Niagara Region visit Niagara-on-the Lake in Ontario Canada. You’ll be glad you did !